Jeff got the travel bug when he was 15 and went on a school trip to Hong Kong, China and Japan. At last count, he has been to 43 countries and visited every continent except for South America and Antarctica. He plans to remedy this in the fullness of time. This trip is his first with a toddler in tow. He and his wife, Kyung-jin (aka KJ), and little Ian have so far enjoyed spending time with family in South Korea and England, as well as traveling throughout Europe. They have absolutely no plans for the future and no idea where they will go next. And they are enjoying this rather taoist state of affairs tremendously. In addition to his love of travel, Jeff is also a graduate of the University of British Columbia’s Creative Writing program. While there, he started writing a novel called The Unwilling Messiah. For a variety of reasons, it was set aside to gather dust, cobwebs and whatnot. During this trip, however, work has begun anew and chapters from it will be posted to this blog periodically. But mainly, gnomeless.com is a travel blog. 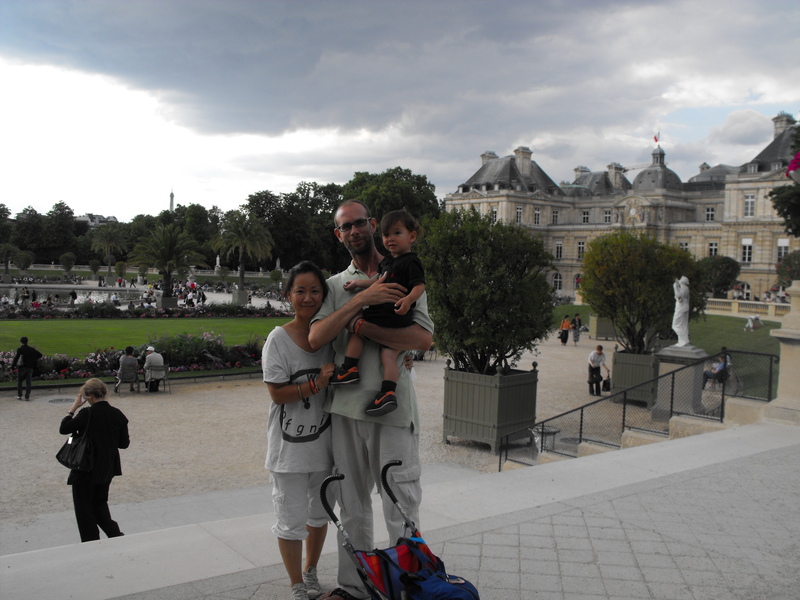 KJ, Jeff and Ian in Paris at one of the world's greatest parks, the Luxembourg Gardens. Hey, really great blog post… I’ve enjoyed reading through your blog because of the great style and energy. I actually work for the CheapOair travel blog. If you’re interested, we would love to have you on as a guest blogger. Please send me an e-mail: gchristodoulou(at)cheapoair(dot)com, and I can give you more information. Looking forward to hearing from you. Wow! Ian grow up!! So cute!! !